The 4th District Court of Appeal upheld a lower court's ruling that the video is public record that must be disclosed, despite objections from prosecutors and Broward County school officials. 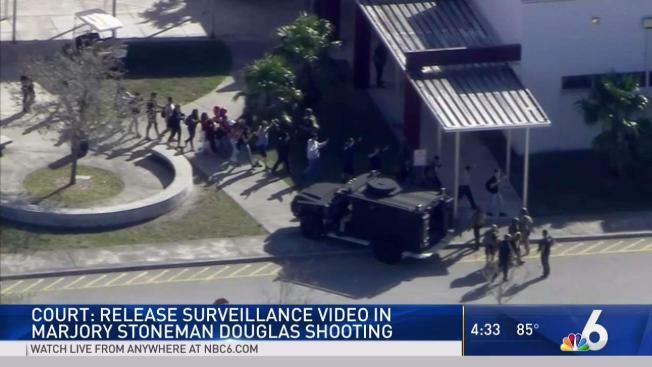 News organizations including The Associated Press are seeking the video to better understand the actions of law enforcement and first responders during the shooting at Marjory Stoneman Douglas High School. Authorities say the school had 70 operating video cameras that day. The media organizations are not seeking any footage depicting the massacre or any victims, but rather the video from outside the shooting scene at the school's Building 12 that depicts law enforcement actions. The Broward County State Attorney's Office contended the video should not be released because it's part of an ongoing criminal investigation. The school board argued that disclosing the footage might pose a security risk by showing blind spots in camera coverage at the school. Hear the dispatchers and police officers communicate during the shooting at Marjory Stoneman Douglas High School in Parkland, Florida, after the tapes were released. The appeals judges were unpersuaded. "The media showed the need for the public to actually witness the events as they unfolded because the narrative provided by 'the authorities' is confusing and has shifted and changed over time," the three judges wrote. "The footage itself would reveal if the first responders rushed into Building 12 to confront the active shooter, formed a perimeter, or hid in stairwells and behind their vehicles for an unreasonable length of time." The judges called it a "sad commentary on our times" that such a full public debate about school security and law enforcement response to a mass shooting is required. But they said parents and the rest of the community needed to see the video for themselves. "Parents have such a high stake in the ultimate decisions that they must have access to camera video footage here at issue and not blindly rely on school board experts to make decisions for them," they ruled. The state attorney's office declined to say whether it would appeal to the Florida Supreme Court. The appeals court said the video must be released by the Broward Sheriff's Office within 48 hours of Wednesday's ruling. Nikolas Cruz, 19, is charged with 17 counts of murder and 17 counts of attempted murder in the shooting. His lawyers have said he would plead guilty if prosecutors would waive the death penalty, but that offer has been rejected.